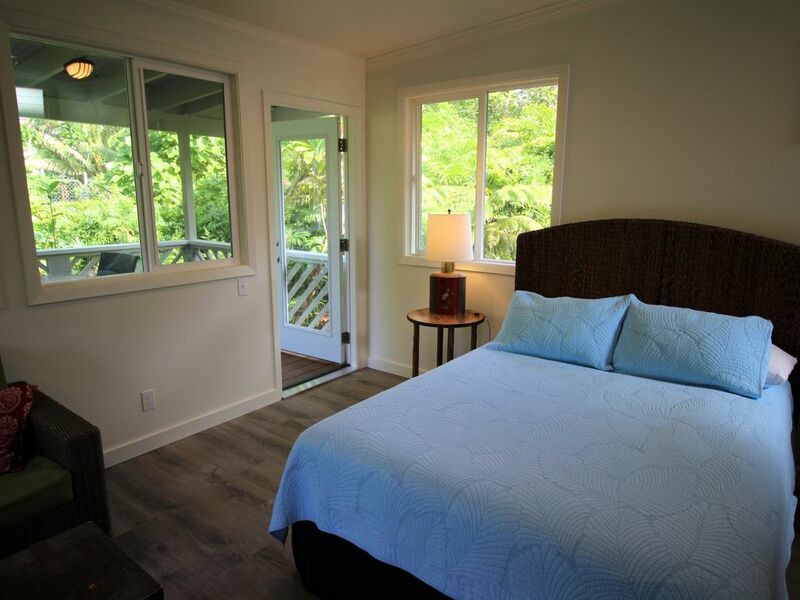 Here is a unique retreat, set in the charming and historical Hilo beach neighborhood of Keaukaha, that feels like the old Hawaii. Spacious studio bedroom with full bath and private lanai. Property is across the street from the ocean & surrounded by the rainforest. Beautiful and Cozy room with comfy queen bed, HD Smart TV, full HD cable with Netflix (etc.) and high speed WiFi. Kitchenette includes small refrigerator, microwave, toaster and coffee maker. Clean, relaxing, and luxurious. Originally built as an artist studio, the 'Ohana has just been completely remodeled and transformed into a perfect get-away. It's separate from the main house, very private and has it's own separate entrance. There are lots of large windows, all facing the rain forest. We added more space (higher ceilings and a little more square footage), a new private covered lanai off the back, new flooring, windows, custom kitchenette, recessed lighting, ceiling fan, etc. It maintains that old Hawaii feel but everything is nice and new. The kitchenette has custom cabinets & a granite counter. You can eat indoors at the bistro table or out on the covered lanai and enjoy the sounds and colors of the forest. • Beautiful rainforest/garden setting and views. Just a short walk to the ocean. There are beach parks within 5 minutes of this property including Carlsmith Beach Park, Leleiwi Beach Park and the popular Richardson's Beach Park with black sand. Hilo Town is home to one of the best Farmer's Markets in Hawai'i and some of the best restaurants around. Yummy dining options, shopping, gateway to Hawai'i Volcanoes National Park, orchid orchards, waterfalls, rainforest, golf, zip lining, hiking, and more. We are happy to share our knowledge about where to go and what to do while on the Big Island. We also own two popular vacation rentals in Volcano, Hawaii, VRBO 756303 and VRBO 1329717. Cathy and Jeff Dale love the Big Island and are excited to share this wondrous place with you. Born and raised in Hilo, Cathy has returned to live here after 25 years in Northern California. Jeff fell in love with Hawaii on the first of many visits from California and is fulfilling a life long dream to live here full-time. Enjoy a piece of Hawai'i in a special corner of the Big Island of Hawai'i without breaking the bank. We love our kama'aina (local) style island home and are excited to share it with others wanting to experience the beauty of the Big Island. This home was built in 1938 by Cathy's grandparents. The 'Ohana was originally built as an artist's studio. The studio is part of a one acre property with extensive beautiful landscaping including fruit trees, tropical plants and flowers. Coffee beans, coffee filters, sugar, creamer. Ultra HD Smart television with Netflix etc. This is like a mother-in-law type suite, but with privacy! Everything you need and then some. The frogs and birds were a great way to sleep and rise the next morning. Cathy and Jeff were super nice and really do pay attention to the details. If you get a chance, go to Hilo Bay Cafe as well as Short and Sweet Bakery! Absolutely loved this rainforest hideaway! Felt so spacious and so open but also felt so secluded like you’re in the rainforest. I loved hearing the coqui frogs at night! There’s a small private beach about 5 minute walk from the studio that’s so beautiful! If we’re ever in Hilo again I would definitely stay at Cathy & Dale’s again! They are the best hosts! It was exactly as portrayed and expected. Lovely. Fabulous location. Comfortable bed. Everything we needed was provided. The only downside was the night noise from tree frogs but even so, I would stay here again in a nanosecond. Cathy graciously greeted us when we arrived and showed us around the studio. It was newly remodeled and spotlessly clean. The room was very open and airy and we loved the adjoining porch. The surrounding yard and beautiful garden made you feel like you were in a peaceful rain forest. The location was perfect- near the beaches of Hilo. Although it was a block from the ocean, you could still hear the soothing sound of waves crash on shore. Loved our stay! Highly recommend to others. Great location to start out our Big Island vacation. The room was light and lovely with a fresh remodel. It was apparent that the remodel was done with quality and care There is no stove/oven or abundance of kitchen utensils so cannot do a lot of cooking (oh darn, we have to go out ;-). We loved the close proximity to local beaches. Carl Smith Beach was fantastic with close turtle encounters and safe swimming even when the ocean beyond was rough. Coquis made themselves known at sunset, but we are used to that from coming to Kalapana for years. We had a lovely stay.